Coderr acts like a plugin running in the background of your application, activating itself and registering whenever an error is detected, but never interfering with your normal operations. Once an error is detected, Coderr automatically collects relevant information from your application and subsequently sends an error report to the Coderr Server for further analysis. With the information collected and provided by Coderr, you can easily identify and correct bugs without having to contact the user or read through log files. Coderr allows you to get an overview of how many errors each of your applications had and how many were corrected. You can use that information to prioritize between quality issues and new features, and therefore improve the efficiency of your work. Most users do not report errors, unless the error inflict pain. Coderr detects errors in real time and reports every single one, so you won't miss any vital information. Coderr gives you a clear, at-a-glance overview of the issues affecting your code, with the ability to drill down to understand the effect on the overall application. Divert resources to fix the issues which are causing the most pain to users, and ensure that you minimize any downtime. Less disruption to users equals greater satisfaction - a win for everyone. Coderr frees up valuable time by automating the majority of steps in the error handling process. One hour saved on error handling is one hour more for building new features. Coderr works the way you do, following a logical three-step process. 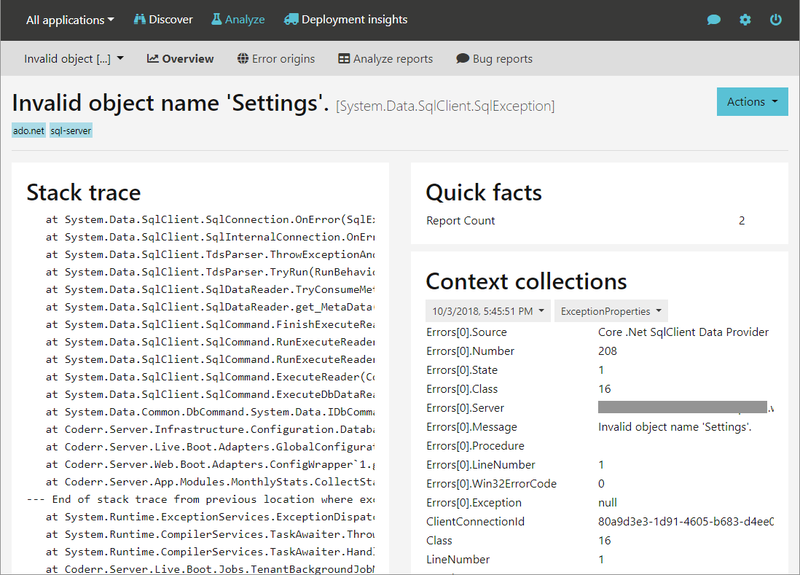 Use the "Discover" tool to identify and prioritize errors in your application. Use "Analyze" to understand and correct them, and use "Deployment Insights" to track progress over application versions. Coderr collects, stores and reports all the necessary information on each error automatically. There’s typically no need for programmers to add extraneous information such as log lines to the code base. To avoid reporting overload, you can configure Coderr in line with your business plan to prioritize errors by a range of criteria, such as affected servers, frequency or user impact. Coderr will inevitably find more errors than you can by yourself or that users report. It will also help you solve all errors in a fraction of the time and warn you in case they resurface in newer versions of the application.